BP has denied claims by one of its partners that its handling of the Gulf of Mexico oil spill amounted to "gross negligence". BP said it "strongly disagrees" with Anadarko Petroleum, who said BP's behaviour in the run-up to the disaster was "reckless". Anadarko, the largest independent oil and gas company operating in the Gulf, owns 25% of the well. The Deepwater Horizon rig exploded on 20 April, killing 11 workers. BP has faced mounting criticism for its handling of what has become the worst environmental disaster in US history, as the leak continues to spread despite efforts to contain it. But BP's chairman Carl-Henric Svanberg has said it remains a "strong company" despite the "setback" caused by the spill. Mr Svanberg has also said that Chief Executive Tony Hayward would be handing over the day-to-day response to BP managing director Bob Dudley. Mr Hayward was challenged by a US Congressional panel earlier this week, and faced accusations that the company had ignored dangers when drilling in the Gulf. James Hackett, chief executive of Anadarko Petroleum, said it was considering "contractual remedies" for what the company has described as BP's "gross negligence or wilful misconduct" over the spill. "The mounting evidence clearly demonstrates that this tragedy was preventable and the direct result of BP's reckless decisions and actions," he said. Mr Hackett added that Anadarko would have acted differently in the lead-up to the April blowout. BP responded that Anadarko was "refusing to accept responsibility for oil spill removal costs and damages", despite a written agreement that the parties would share the costs of any clean-up after a spill. The oil giant had said on Wednesday that it expected its partners in the well - which include Anadarko and Mitsui, with a 10% share - to meet their legal obligations. President Barack Obama has vowed to make BP pay for the damage, and a criminal investigation is underway from which potential fines and damages could run into billions of dollars. 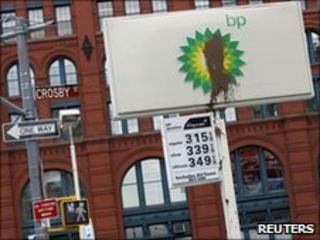 BP has agreed to put aside $20bn (£13.5bn) to compensate victims of the oil spill - and has vowed to help with the clean-up. A containment cap and another device are capturing some 25,000 barrels of oil a day - the latest estimates suggest 35,000-60,000 barrels a day are spewing out. On Friday, rating agency Moody's downgraded BP's credit rating by three notches, following similar moves by the other two rating agencies earlier this week. At a US congressional panel on Thursday, House committee on energy and commerce chairman Henry Waxman said BP's "complacency" before the rig explosion had been "astonishing". This week, the BBC is assessing the impact of the Louisiana oil spill. Correspondents in the US, the Gulf of Mexico, Brazil, Nigeria and London are reporting for the BBC World Service, World News TV and the BBC News website. He accused Mr Hayward of "stonewalling" for failing to answer his questions. But Mr Svanberg defended the chief executive, saying the answers would have to wait until a BP inquiry into what happened was completed. Russian President Dmitry Medvedev said in an interview with the Wall Street Journal on Thursday that BP had to pay "a lot of money this year". "Whether the company can digest those expenditures, whether they will lead to the annihilation of the company or its break up is a matter of expediency," Mr Medvedev said. But the BP chairman rejected his company was facing that prospect. "The company is strong, the company has strong underlying performance - strong cash flow, strong operations," Mr Svanberg said. But he added that it was impossible to know the final cost of the spill until it had been stopped. BP says it will withhold dividends until the end of the year as part of its response to the spill.